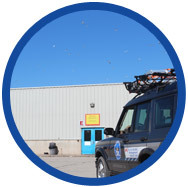 Since 2010, The Wildlife Management Group has been part of our safety and environmental initiatives by providing professional bird control services for the control of gulls and Canada Geese to our site here in Burlington, Ontario. They provided us with a thorough assessment, options for controls, and a very effective program which has contributed to a healthier environment for both our employees and customers. The Wildlife Management Group has played a significant part in helping us maintain our site in Ontario. 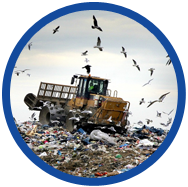 As a disposal and recycling business, birds, specifically gulls can be attracted to our site and are sometimes more than a nuisance. The staff at The Wildlife Management Group provided us with a professional and diligent assessment, identifying the regional bird presence, associated hazards, and implementing strategic, humane controls to reduce the gull population at our location. Their role in our gull control program has improved the health and safety to our site, and has contributed to maintaining aÂ healthy balance with wildlife as part of our environmental program. We take pride in our operations and the successful safety initiatives we have maintained for the past 55 years. As we are located in a growing urban environment, our on-site ecology attracts wildlife that is common to both urban and rural environments, including geese, gulls and mammals. A critical part of our operating platforms is the maintenance of our Airport Wildlife Management Program which addresses the issues brought forth by wildlife in our operating environment. Our initiatives are based on both a scientific and practical approach, where we strive to maintain a healthy balance with local wildlife while ensuring a safe operating environment. 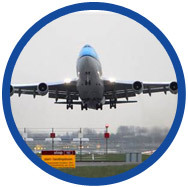 Since 2001, Michael Von Kaitz and his staff at The Wildlife Management Group have played a significant role in developing our wildlife program, maintaining compliancy with our ever-changing regulatory ordinances, as well as applying strategic controls and management techniques equivalent to those used in large international airport operations. From professional hazard risk assessments to regular onsite controls applications, the staff at The Wildlife Management Group provides us with diligent service, and I have found Mr. Von Kaitz to be a thorough and reliable professional. I would highly recommend the services of The Wildlife Management Group to anyone who requires a professional company to resolve or prevent wildlife issues at their location.